The ASUS GTX 680 graphics card features NVIDIA’s® next generation 28nm GPU design that offers the most immersive gaming and media experience. NVIDIA® GPU Boost technology dynamically maximizes clock speeds for maximum performance, while the 28nm GeForce GTX 680 GPU features a very efficient and power friendly design thanks to its SMX architecture. ASUS GPU Tweak helps gamers and overclockers make the most of this powerhouse card through a flexible and intuitive user interface. NVIDIA® Adaptive Vertical Sync promotes a smoother game experience with all details set to maximum and NVIDIA® 3D Vision® provides the best 3D gaming and media experience on the PC. Based on the new 28nm “Kepler” architecture, the ASUS GTX 680 delivers unmitigated DirectX® 11 performance and full readiness for the next phase of PC entertainment, which will take gamers and multimedia consumers beyond full HD. Due to its unparalleled processing power, the GeForce GTX 680 can handle ultra HD or 4K resolutions in games and video, extending visual finesse and quality beyond current standards. At the same time, 28nm GPU design means reduced power consumption and greater efficiency, leading to a modest 195W TDP under load. With its 1536 CUDA cores, the GeForce GTX 680 offers enhanced general processing GPU output to speed up overall system performance. It ships with a 256-bit memory interface and 2GB of GDDR5 clocked at 6008MHz. The new dynamic NVIDIA® GPU Boost modulation means the card can alternate between the base clock of 1006MHz and then increase 1058MHz to or more when extra frames per second are needed in the most demanding games. This flexible design is further improved upon by ASUS through the presence of exclusive GPU Tweak. 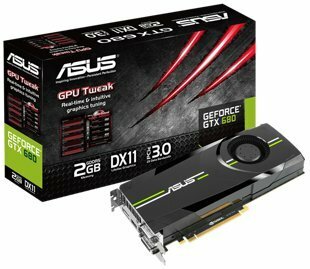 ASUS GPU Tweak has established a firm reputation among gamers and overclockers as the most flexible and intuitive graphics tuning suite on the market. It features improved GPU versatility via unlocking a wider clock speed range, and therefore blends in seamlessly with the new GPU Boost design from NVIDIA®. GPU Tweak allows overclockers to get the most out of the ASUS GTX 680, with its intuitive and accessible interface putting all tuning resources within easy reach. It can safely overclock the GPU beyond reference specifications and offers improved 2D/3D benchmarking via mode locking. Gamers can also pull up an on-screen widget for instant card monitoring. GPU Tweak ensures the ASUS GTX 680 performs at peak levels with live driver and BIOS updates as they become available. The GeForce GTX 680 serves as the launch vehicle for NVIDIA’s® Adaptive Vertical Sync technology, which dynamically varies VSync on and off to display frames in a regular cadence that minimizes stuttering or reduces tearing in games. The ASUS GTX 680 features an all-new display engine that is capable of driving three displays for gaming and an additional fourth accessory display simultaneously. With its improved performance, the GeForce GTX 680 natively supports NVIDIA® 3D Vision® Surround multi-monitor gaming from a single GPU. NVIDIA® 3D Vision® is compatible with hundreds of PC titles, many of them designed to make the most of it from the ground up. GeForce GTX 680’s display engine also fully supports HDMI 1.4a, 4k monitors, multi-stream audio and a new film-style AA technique called TXAA.